Outside my window...the sun is shining and the air is crisp. It's a perfect fall day. I am thankful for...my noisy kids. From the learning rooms...the letter of the week is T (for turtle) and reinforcing emergency information such as address, phone number, and dialing 911. From the kitchen...a pile of dishes that need washed. No clue what is for dinner...hot dogs and french fries sound easy enough. I am wearing...a red t-shirt and blue jean shorts ~ feet are bare just the way I like it. I am creating...ideas on how I want my life to be and how I'm going to achieve those goals. I am going...to continue to pray hard. I am reading...Kiss Me Again by Barbara Wilson. I am hoping...for Fall to last a little while. I am hearing...the movie The Chamber on tv. Around the house...needs some straightening and organizing is needed in the bedroom. Everything else is looking good. One of my favorite things...fried green beans ~ got the recipe from Miss Amanda. 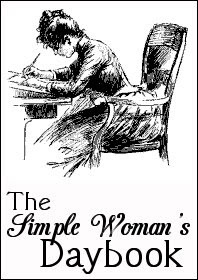 Be sure to click HERE to read more Simple Woman Daybooks.